So with a brand new year, this will be my first post. Let’s continue on with my trip to Kyoto. On a day that the forecaster predicted to rain, you would see every Japanese with an umbrella on their arm. Some used them as a walking stick, but all of them used them as the tool that it supposed to be. I like the transparent 500 yen umbrella. I wanted to buy it but I am not sure if I could bring it on board flight so I used the one that I brought along. So yeah, I visited Ryoanji on a rainy day. It was cold too but I had no other choice.I really wanted to see Ryoanji in person. Autumn was slowly fading away on this day but I could see still catch a glimpse of the color contrast here. There were not many tourists here probably because of the rain and I was early. 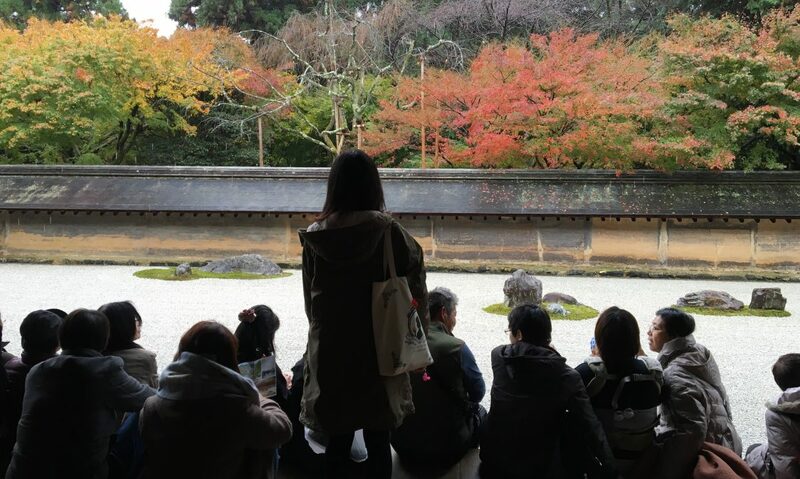 Ryoanji is a zen temple which is famous for its rock garden. There are 15 rocks at the garden. At any angle, at least one of the rocks would be hidden from the viewers. This makes this temple very interesting. There was no clear meaning in history to why this garden was built. Some believe it represents a tiger carrying its cubs across an islands of sea while some claim that it shows abstract concept of infinity. I did not stay around to get an angle that could see all 15 rocks but some did claim that online. You can do some google to see its true. Heading out of the garden to take a stroll with the rain. The view was a beauty. If not for the rain, I am sure its even better. Before leaving, I went into a restaurant to get some hot food as it was getting colder. With a 1000 yen, I got a curry rice (No Meat) and a cup of tea. I ordered it in Japanese, yeah in Japanese! Just that I was asked coffee or tea in Japanese. Lol. One last shot before I leave. If you like what I post do like it or follow me. I will post trips that I have made through the year. Only a few times that you would see some emo posts. Hope to see your comments if there is anything that you think I can improve on.